ROADTRIP-'62 - What Happened to US-16? I’ve mentioned many times on Roadtrip-'62 ™ that most US-numbered highways have been shortened over the years since the Interstate freeways were constructed. One of the most severely shortened is US-16, which has lost over 1200 miles over the years. In 1962, it ran about 1700 miles from Detroit, Michigan to Worland, Wyoming, including about 80 miles of ferry service across Lake Michigan. The shortening of US-16 began in late 1962, when Michigan eliminated the route in favor of the I-96 and I-196 interstate route numbers. Today it’s only 489 miles long, even though the west end has been overlapped with US-14 and extended from Worland to the east entrance of Yellowstone National Park! Most of the loss is due to I-90 crossing the prairies of South Dakota and Minnesota, but the route also lost its Lake Michigan ferry and the entire road in both Wisconsin and Michigan. I’m going to focus first on some sights we might have seen when US-16 was its full length, some of which are also gone today. Then we’ll progress to some places that are still the same. Beginning in downtown Detroit, something we could have seen there in 1962 but not today is a movie in Cinerama format. Cinerama was the first of several widescreen movie filming and projection systems introduced during the 1950s, in an effort to get people back into the theatres after they had begun staying home in droves to watch the new phenomenon of television. It originally involved projecting images simultaneously from three synchronized 35mm projectors onto a huge, curved screen. Likewise, it used three synchronized cameras sharing a single shutter to shoot the film. This process was later abandoned in favor of a system using a single camera and 70mm prints. The original system was set up to film at approximately the focal length of the human eye, giving a sort of rough 3D effect. Each camera photographed one third of the picture shooting in a crisscross pattern, the right camera shooting the left part of the image, the left camera shooting the right part of the image and the center camera shooting straight ahead. The biggest problems was with the areas where the images overlapped on the screen, as you could actually see the seam and sometimes, especially for movie-goers on the left and right, the images looked sort of offset where they should meet. The sound system was also like today’s surround sound, with five speakers behind the screen, two on the sides, and one in back of the auditorium. During movie production, a sound engineer moved and mixed sounds by a script and during a showing, the projectors and sound system were synchronized. However, Cinerama was somehow more popular and better funded than the other widescreen experiments and lasted the longest. Of course, because of the wider, specialized screen, multiple projectors, and the sound system consisting of eight speakers, theatres had to spend some big money up front just to show Cinerama. Consequently, this meant that there were few theaters that could show the films, and they were mostly in major metropolitan areas. One of these was Detroit, which was the second place to show the first Cinerama production, “This Is Cinerama”, in 1953. The Detroit market played every Cinerama movie that was released in the domestic market and was the only place in the United States to do so. The last offering in the original run was the Cinerama re-issue of “2001: A Space Odyssey” in 1977. In 2015, The Music Hall brought three Cinerama movies back for a special five-hour marathon event! There were two Cinerama movies screened in Detroit in 1962, “Holiday in Spain” and “The Wonderful World of the Brothers Grimm”. “Holiday in Spain” was a re-edited version of “Scent of Mystery” which had originally been filmed in Todd-70, another widescreen format. The Brothers Grimm movie was a brand new production. I never saw a film in Cinerama format when I was a kid, but I did see a film shot in one of the competing widescreen formats, Cinemiracle, and converted to show in Cinerama. My dad took the whole family down to the Detroit Music Hall to see “Windjammer” during its run in 1960. The Detroit Music Hall Center for the Performing Arts is still open in Detroit, with a full season each year of a variety of music ranging from Snoop Dogg to ballet, jazz, and current Broadway musical touring companies. We crossed US-16 at Brighton, Michigan on our US-23 journey. This trip, we’ll cross US-23 at that same spot as we drive the old route on Grand River Avenue to the west side of the state. The relaxing ferry ride across Lake Michigan, from Muskegon, Michigan to Milwaukee, Wisconsin, is another loss from 1962. Two routes, US-10 and US-16, used to cross Lake Michigan on ferries, back when railroad companies operated such ferries. While US-16 now ends hundreds of miles from the lake, US-10 still has this discontinuity, and you can still have your car ferried across the lake up at Ludington. The Grand Trunk Western was the last of the three railroads to start Lake Michigan ferry operations, beginning in 1903 from Grand Haven, Michigan to Milwaukee. In 1905 they moved to Muskegon and had two ships still operating the US-16 route in 1978, when the route was discontinued. The Grand Rapids was built in Manitowoc, Wisconsin in 1926 and was apparently scrapped when the line closed. The City of Milwaukee was built in 1931 and used as a Landing Ship Tank during World War II. It began Grand Trunk Western ferry service in 1946 and when its ferry service ended it was chartered to the Ann Arbor Railroad for use on its Frankfort, Michigan to Kewaunee, Wisconsin run for a few years. Though you can’t ride it across the lake anymore, if you go up to Manistee, Michigan you can see the City of Milwaukee restored to its original 1931 outfitting as a museum ship. It’s open to the public for guided tours, special events and even private party rentals. Today you can take a much faster ferry between Muskegon and Milwaukee: Lake Express has operated a specially constructed high speed auto passenger ferry on a 2½ hour run since 2004. So now that we’re in Wisconsin, what’s hiding that used to be on US-16? As I already looked at The Wisconsin Dells, I’ll look elsewhere today. Come to think of it, I’ll stop at the home of something that straddles the line between was and is, the home of Old Style beer in La Crosse, Wisconsin. Old Style IS because you can still buy the beer and it’s still brewed in its original brewery. But it WAS because the company that originally brewed it is out of business…it’s a long story. Beginning life as The City Brewery in 1858, the name was changed to G. Heileman Brewing Company in 1872, when Heileman’s partner left the business. It remained a small local brewery until Mr. Heileman died, after which his wife Johanna and other family began to expand. By the time Prohibition began in 1920, they were distributing to 34 states. 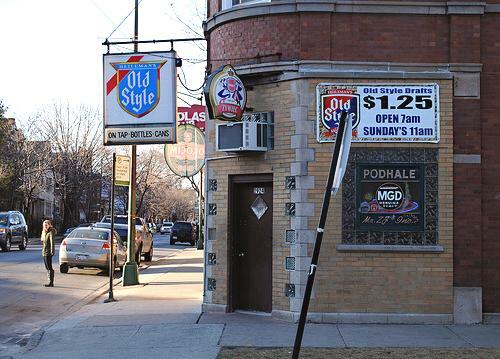 During this expansion period, they first brewed Old Style and it was the main product they marketed. Of course, during Prohibition they could not brew or sell regular beer, so they muddled through with a low alcohol brew named New Style. Heileman also began producing soft drinks and malt tonics with little success. They finally hit a successful product with Malt Syrup, which sold well to consumers using it in private beer-making. Following the end of Prohibition, the Heileman family members sold their shares of the company and new management jump-started growth again with new brands, new markets, and buyout of other brewers. This growth brought Heileman to 4th place among American brewers by 1971 and you could buy an Old Style nearly anywhere in the country. Many other brands we could have bought in 1962 were folded into Heileman’s holdings, including Black Label, Blatz, Drewry's, Falls City, Grain Belt, National Bohemian, Olympia, Rainier, and Wiedemann. As many companies did during the 1970s, the company also expanded into unrelated business lines such as baking, snack foods, and mineral water. Only the mineral water business worked out well, producing the La Croix brand in 1981. But in 1992, perhaps because it did not fit with their beer marketing experience, they sold the brand to National Beverage. Despite being in the top five, Heileman's sales were almost unchanged throughout the 1980s, due at least in part to brutal marketing strategies in the brewing industry and the overall decrease in the sale of beer throughout the 1980s. Finally, the buyout binge came from the other direction as the owners of the Toohey brewery in Australia bought out Heileman hoping to create a worldwide brewing company. It was financed with junk bonds, a common buyout currency of the day, and the entire financing scheme collapsed in 1991, leaving Heileman in bankruptcy. It was quickly sold in 1994 and again in 1996 to the Stroh Brewery Company. When Stroh was split up as part of a merger deal between Pabst Brewing and Miller Brewing, the famous Old Style brand ended up with Pabst. They stopped brewing it in La Crosse, preferring to brew it under contracts in other locations. The brewery buildings were sold in 1999 to investors who founded the new City Brewing Company, named after the original company. Today, under license from Pabst, Old Style is once again brewed in La Crosse at its original site! After crossing the Mississippi River, the farm fields of the Great Plains stretch out ahead of us for hundreds of miles across Minnesota and South Dakota to the Missouri River. About midway across Minnesota we cross the Blue Earth River at the town of Blue Earth. Downriver, where it flows into the Minnesota River, is the town of Le Sueur. You probably do not recognize either of those names but would certainly recognize the place if I told you we were in the Valley of the Jolly Green Giant! Though you might have figured that out for yourself when you saw the 55 foot tall fiberglass statue of the Jolly Green Giant beside the I-90 freeway, which was erected in an opening ceremony for the freeway. The Green Giant brand dates back to 1925, when the Minnesota Valley Canning Company, also canning the Le Sueur brand, developed seeds for a tender and larger pea they canned as Green Giant. They later applied the name to a full line of canned vegetables and in 1950 renamed the company Green Giant. The familiar figure in a leafy suit named The Jolly Green Giant was created in 1935, replacing the original figure that looked more like a stereotypical caveman in a fur. The advertising jingle “Good Things from the Garden” and “Ho Ho Ho” were first developed in 1961, just in time for us to see as television advertising took off. Green Giant has gone through the same pattern of corporate buyouts and divestitures that most older brands have. Pillsbury acquired the company in 1979 and General Mills bought Pillsbury in 2001. In 2015, General Mills sold the brand to B&G Foods but retained a license to operate the Green Giant business in Europe. B & G still owns the brand, along with more than 50 familiar brands including others we have eaten in 1962 such as Underwood Deviled Meats, Durkee spices, Brer Rabbit molasses, B&M Baked Beans, and Cream of Wheat. Most of their corn is still packed out of Minnesota, as they also have a unique sweet corn hybrid seed. But as a way to celebrate the farm bounty of the Great Plains, even the Jolly Green Giant shrinks compared to the Corn Palace of Mitchell, South Dakota. 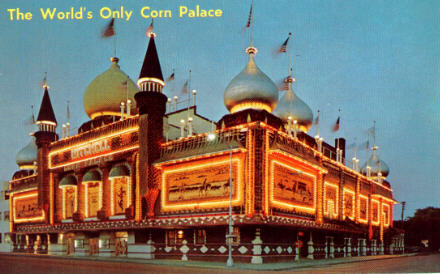 What is a Corn Palace, you may ask? The World’s Only Corn Palace is Mitchell’s top tourist attraction, grabbing about 500,000 tourists each year off the freeway to see uniquely designed murals on the building’s exterior, made from corn and other grains. Back in the 1890s, several cities in South Dakota and Iowa constructed buildings to showcase their agricultural bounty: a Corn Palace in Sioux City, Iowa, a Corn Palace in Gregory, South Dakota, a Grain Palace in Plankinton, South Dakota, and a Bluegrass Palace in Creston, Iowa. Of these and perhaps others, only Mitchell’s remains, having been reconstructed twice, larger and more permanently. The current building is of reinforced concrete, constructed in 1921. In the 1930’s, the minarets and onion domes of Moorish design were added, restoring the appearance of the original Corn Palace. Today, it functions as a gathering place for special events such as industrial exhibits, stage shows, meetings, banquets, proms, and the home court of the local high school and college basketball teams. It also continues in its original function as home of the annual Corn Palace Festival held in late August each year. The Palace is redecorated each year with naturally colored corn and other grains and native grasses to create the murals, which are new designs each year. We won’t see the same murals that we would have in 1962. The 1962 panels’ theme was “Yesterday and Today”, designed by Oscar Howe. Mr. Howe had been an artist-in-residence at the local Dakota Wesleyan University in 1948 and graduated in 1952. He designed the murals from 1948 to 1971. Howe, who was a Yanktonai Sioux born on the Crow Creek Indian Reservation, became Artist Laureate of South Dakota. The corn is nailed to the building one ear at a time to create a scene, with the old murals stripped at the end of August and new ones completed by the first of October. Only once, in 2006, was the annual redecoration skipped, when a drought severely limited the local corn crop. Dakota Wesleyan University’s digital media and design department have finalized the creation the 2019 murals: previews on the Corn Palace website show an Armed Forces theme for 2019. Though US-16 travels through Badlands National Park, US-14 meets it just a few miles north, so I discussed the Badlands on my US-14 trip. I also discussed the city where they meet, Wall, South Dakota. Today, we’ll drive directly to Mount Rushmore National Memorial. South Dakota historian Doane Robinson is credited with the idea of carving the images of famous people into the Black Hills region of South Dakota as a way to promote tourism in 1923. The next year, he persuaded sculptor Gutzon Borglum, who had been involved in the Confederate Memorial at Stone Mountain, Georgia, to inspect the area to ensure a carving could be accomplished. After considering various locations and subjects, it was decided to place four presidents on Mount Rushmore. Fundraising began, including a contribution from Congress, permission was obtained from both Congress and the State of South Dakota, and between 1927 and 1941 Gutzon Borglum and 400 workers carved the memorial. I enjoy the drive along US-16 ALT to the mountain for the scenery, which includes views of the Presidents from various angles and through a tunnel on the highway. You might also spy buffalo or mountain goats from the road. Besides viewing from the Lincoln Borglum Visitor Center, the Presidential Trail gets you closer to the sculpture and offers many different views. You can also visit Gutzon Borglum's Sculptor’s Studio, walk the Grand View Terrace with flags from all 56 United States and territories, and stop at the information center. Also in South Dakota is Jewel Cave National Monument, which became a national monument in 1908. The park contains Jewel Cave, the third-longest cave in the world, with over 195 miles of mapped and surveyed passages. It was found as just a small hole in the rock, with cold air blasting out, about 1900. The brothers Frank and Albert Michaud enlarged the hole with dynamite, began exploring, and filed a mining claim that year. 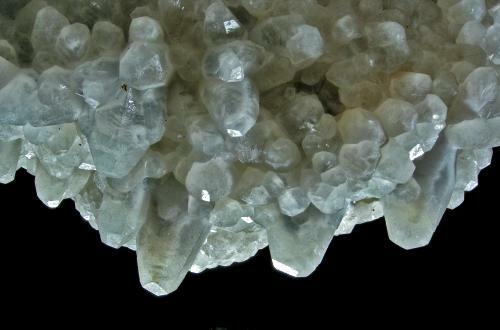 They discovered passageways and rooms covered with nailhead spar crystals that sparkled like "jewels" in their lantern light, giving the cave its name. The Michauds tried to develop the area into a tourist attraction, but the low population of the region and the difficulty of travel at that time made for failure. When the area became part of the national monument a few years later, the Michauds sold their mining claim back to the government. The Civilian Conservation Corps established a camp at Jewel Cave in May 1935, building a cabin, restrooms, sewage and water connections, and campground. The cave entrance was improved along with a surface trail and stone stairway. A National Park Service Ranger was stationed here and began conducting cave tours and providing visitor services in 1939. By 1959, only two miles of Jewel Cave had been discovered, so we would have had a very limited tour in 1962. But Dwight Deal, a geologist, and two assistants explored enough that by 1961 over 15 miles were known. This included today’s "Scenic Area", which was actually outside the park boundaries! A land swap with the U.S. Forest Service was accomplished in 1965 and the National Park Service constructed the present scenic area cave trail, the elevator shafts, the visitor center, and parking lot. This all opened for the new Scenic Cave Tour route in 1972. Besides the cave, there are also several surface trails that provide views of the forest atop the caves, limestone cliffs, and canyons. Link to home-page-archives.htm, us-23-archives.htm, us-6-archives.htm, blog-archive.htm, or history-archives.htm as appropriate. Continuing west, in 1962 US-16 would have ended west of the bottom of Ten Sleep Canyon, at Worland, Wyoming. The canyon is another steep canyon with great views, like its cousin to the north on US-14, Shell Canyon. Over the past two decades, the canyon has become one of America’s top summer rock climbing destinations. Near the top of the canyon is Ten Sleep Fish Hatchery, which facilitates the hatching and rearing of several species of trout including rainbow, brook, cutthroat, splake, and tiger trout. You can catch some of the fish released here further down the creek if you buy a license in the nearby town of Ten Sleep. Maybe it’s appropriate that US-14 and US-16 have been dual-signed across much of Wyoming, as both routes began life as parts of the Chicago, Black Hills, and Yellowstone Highway, or B and Y Trail. In the days before route numbers, the B and Y Trail split in the eastern part of Wyoming, with one part following today’s US-14 ALT and the other part following US-16 to reunite in Cody, Wyoming on their way to Yellowstone National Park. That’s just what they do once again after many years where US-16 ended in Worland. We already visited that end of US-16 when I discussed US-14, so it’s the end of another trip for Roadtrip-'62 ™. See you next time! All photos by the author and Copyright © 2018 - Milne Enterprises, Inc., except as noted. All other content Copyright © 2018 - Milne Enterprises, Inc.
Click to buy atomic starburst design bowls: perfect for a 1962 kitchen. Buy yourself some of the great music of 1962! Copyright © 2018, and ROADTRIP-'62 ™ - Milne Enterprises, Inc.